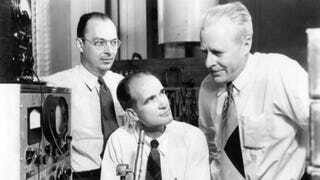 65 years ago, December 16th 1947, William Shockley, John Bardeen, and Walter Brattain operated the first ever working point-contact transistor, almost known as the iotatron. Now, so many years later, we rely on the descendants of that transistor as a part of practically all of the high tech electronic devices we use every day. While the anniversary of the first working point-contact transistor is today, the actual research behind the component reaches all the way back to 1925 at least, when similar components were patented. It wasn't until after World War II however, that Bell Labs was really able to get down to business and actually make one that worked, developing what might be the most important invention of the 20th century. The rest is history.